This year's E3 has motion controllers, 3D capable doo-hickies, and plenty of unreleased videogame goodness to last you the whole year. But along with all the glitzy top tier entertainment products, there is also a fair share of strange events and geeky characters roaming around the all-too crowded show floor. Let GeekTech take you on a tour of all the odd sights to be found off the beaten E3 path. 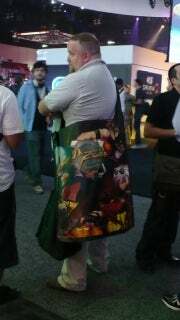 The photo to the right shows a ridiculously huge swag bag provided to E3 attendees by MMO developer Perfect World. Yes, the expo-swag-lusting nerd has evolved, and is now able to carry more gamer goodies back home and onto eBay than ever before. If you get tired walking around E3 (pretty much a given), you're definitely going to need some sustenace to keep you alert and attentive. Gamer Grub thinks it has the answer for all gamers out there that want a snack with an extra, real-food kick, but without the crumbs or resulting greasy fingers. Gamer Grub comes in several tantalizing flavors, ranging from Pizza and BBQ to PB&J and S'mores. That said, I think the most unholiest union would be Gamer Grub flavored with Mountain Dew. Suppose you're scarfing down your Gamer Grub too fast and get it all over your keyboard: is it time to make a Best Buy run for a keyboard cleaner? No way. E3 has you covered with Cyber Clean, a green gelatinous goop that rests itself atop your hardware, absorbing any matter of grime and dirt. If you've ever experienced E3, you know that not everyone is the person their badge claims him to be. But rarely do you ever get the chance to prove this. At first I was amazed I had run into the fighting game god himself, Daigo Umehara, but something seemed off about this young, Japanese guy--most notably the fact that it wasn't really him. Have you ever had the chance to attend E3? What was your favorite part? What was the weirdest thing you've seen at the show? Any memorable run-ins with a gamer celebrity (or "celebrity")? Share your experiences in the comments below! More gaming coverage from PCWorld's Game On blog!